These 22 legendary, 18th and 19th century public squares were designed to be - and still are - an integral part of downtown Savannah. Located throughout downtown Savannah, these 22 legendary, 18th and 19th century public squares were designed to be - and still are - an integral part of the city. This "noble sequence of wooded and gardened squares . . . form[s] the glory of the city" William Dean Howells wrote almost 100 years ago. The Squares are set out within a unique grid of streets and "lanes" (or alleys) that follows a pattern established by General James Oglethorpe when he founded Savannah in 1733. It is "the most intelligent grid in America, perhaps the world," says the urbanist author and architect John Massengale. Oglethorpe's plan of squares and streets for Savannah is "so exalted that it remains as one of the finest diagrams for city organization and growth in existence," claimed the Philadelphia planner and author Edmund Bacon. The American Society of Civil Engineers has designated Oglethorpe’s plan a National Historic Civil Engineering Landmark, and in 1994 the Savannah city plan was nominated by the Federal Interagency Panel to the UNESCO World Heritage List. In Savannah Oglethorpe is "hailed appropriately, as the city father, a visionary, and mentioned regularly in the public discourse, not unlike the framers of the U.S. Constitution." (Duany, Plater-Zyberk, and Speck) The Squares are the heart of the plan. All of the Squares are about 200 feet from north to south, but they vary east to west from a maximum of over 300 feet to a minimum of little more than one hundred feet. The largest squares are thus about three times the size of the smallest. The Squares are now planted largely in live oaks that provide a magnificent tree cover especially appreciated in Savannah's semi-tropical climate. All squares have attractive and convenient seating, two have gazebos, and one has active recreational uses. Many have fountains and monuments at their centers. The monuments include one in Chippewa Square of Oglethorpe, himself, by the noted sculptor Daniel Chester French; one in Monterey Square honoring Count Casimir Pulaski, the Polish general who was killed leading American forces at the Siege of Savannah in 1779; and a coming monument in Franklin Square honoring Haitian volunteers who fought along with Pulaski and the Americans. A massive granite boulder in the southeast quadrant of Wright Square honors Tomochichi, the Yamacraw Mico (or chieftain) who befriended Oglethorpe and allowed him to settle. Each square can be approached from eight public rights of way: one each from the north and south and three each from the east and west. Although all downtown streets carry substantial daily traffic, there are no stoplights at any intersection surrounding any square. As Miss Harty said to John Berendt in Midnight in The Garden of Good and Evil, "the thing I like best about the squares is that cars can't cut through the middle; they must go around them. So traffic is obliged to flow at a very leisurely pace. The squares are our little oases of tranquility." Persons walking have the right of way, and typically the broad sidewalks lining the wide streets continue across squares, so that a person can walk from square to square to square, crossing street after street without having to stop for a car. Downtown Savannah has not needed to be "pedestrianized." As Beth Reiter, Savannah’s Preservation Officer, writes: "the plan’s ingenious flexibility has accommodated the automobile while preserving a pedestrian pace." Because the "pace" of life is so leisurely in downtown Savannah there are many other transportation options to reach the squares besides walking and the automobile. The transit system operates a free trolley that wends its way around a number of squares, as well as offering conventional bus routes. Horse-drawn carriages and charabancs and pedicabs appeal to tourists; bikes, scooters and rollerblades, to students. In the last few years convention-goers and guests at the Westin Savannah Harbor Hotel have been able to reach the squares by a two-minute ferry ride. Because the Squares are so accessible, they are also very visible, and as a person leaves one square another often comes into view immediately. As Allan Jacobs notes, there are 530 intersections in the square mile of Savannah's downtown, more on average than in almost any city in the world without canals. 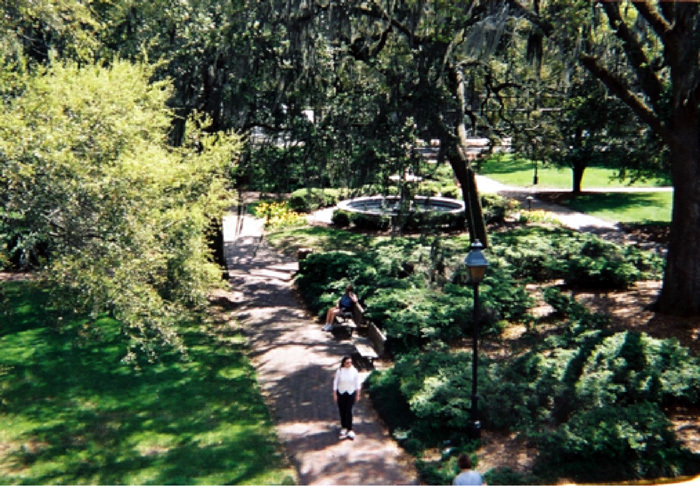 The Squares of Savannah are as accessible and linked to their surroundings as any parks in the world. Visitors to Savannah are often stunned by their first experience of her Squares. Their reaction was well-put by the urbanist writer James Howard Kunstler: "It's an incredibly beautiful place. Savannah is like being on another planet that vaguely has US characteristics, but you're not on the same earth. It's freaky." "La plus belle ville dans l'Amerique du Nord," the most beautiful city in North America, wrote a reporter for Le Monde covering Olympic sailing events held near Savannah in 1996. But this extraordinary beauty has been hard-earned, the result of over a century of vision, patient determination, and hard work by countless citizens. For the last 20 years the City has striven to achieve a "resort quality" appearance in the Squares - to make the "public realm" the equal of the private. 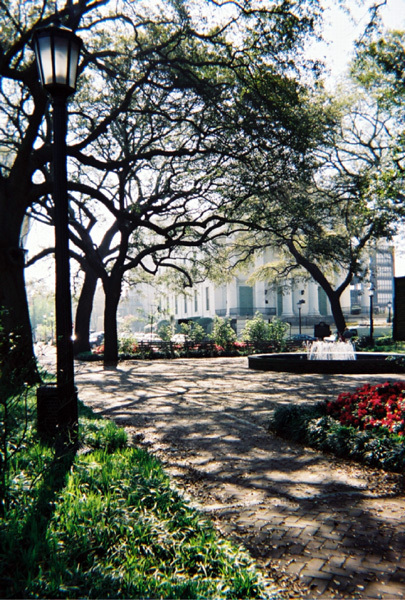 The Squares have become Savannah’s image in the minds of millions throughout the world. Perhaps for no other city in the world are parks so integral to its cultural identity. Like all cities Savannah has crime and poverty, but the City has committed to maintaining the safety and attractiveness of its Squares not only for tourists but for all its citizens. Millions enjoy the Squares every year. Savannah is a city of about 140,000, yet she hosts 5.5 million visitors a year drawn by her extraordinary beauty and vitality. (1.3 million check in at the Visitors’ Center alone, and many thousands of Girl Scouts make pilgrimages to Savannah, the hometown of their founder, Juliette Gordon Low.) Every day thousands of tourists walk through and drive or ride around the Squares, entranced. But Savannah is a living city and not a museum or a theme park. Every day thousands of Savannahians - downtown residents, workers and students - drive, ride, bike (or rollerblade) around the squares or crisscross them on foot on their way home, to work, to school, to play, to worship, to shop, to study, to visit, to dine, to celebrate and to mourn. They often stop to speak with friends and neighbors and some graciously field questions from tourists. As a travel writer recently wrote, Savannahians can be "achingly polite." Because the squares are so many and so varied, they are bordered by a wide diversity of land uses, ranging from modest houses to tall office buildings. Because lots within the Oglethorpe plan are relatively shallow and are typically bounded by alleys to the rear, buildings meet the streets and squares in an urban manner, creating spacious outdoor "rooms." The Oglethorpe plan differentiates lots to the east and west of Squares, which are larger, surrounded by public rights of way, and were originally intended for public purposes, from lots to the north and south of Squares, which are smaller and were originally intended for private use. 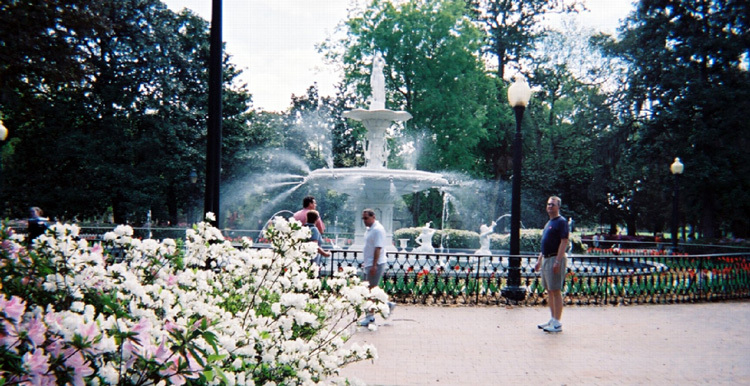 “Oglethorpe designed the squares to be public spaces surrounded by mixed uses. Today that tradition continues as institutional, governmental, residential and commercial uses blend together to create our vibrant historic district and community,” writes Lise Sundrla, Executive Director of the Savannah Development and Renewal Authority. No square is surrounded exclusively by residential uses, and only a few do not have some surrounding residential uses. The current urban trend toward “mixed use” has been Savannah’s history for 270 years. The squares are home to a number of cultural institutions and museums, including the Telfair Museum of Art, the recently restored Lucas Theatre, and the Savannah Theatre, on the oldest theater site in continuous use in the United States. Many government buildings face squares including the Post Office, the Federal courts and other Federal agencies, and State and local offices. Private institutions on squares include the Red Cross, the International Seamen’s House, and the Rose of Sharon Apartments. 13 churches and synagogues adjoin squares, including the synagogue of the third oldest Jewish congregation in the United States, the largest Roman Catholic church in the Southeast, and the oldest African-American church in North America. The Savannah College of Art and Design (SCAD) is a private arts college that has grown to an enrollment of over 6000 students in 25 years. SCAD has restored, renovated or re-used 58 buildings in Savannah, representing an investment of more that $78 million. SCAD has made the city its campus and many of its classrooms, offices, galleries, athletic facilities and student housing adjoin squares. The many and varied activities of its students, faculty and staff add greatly to the life of the Squares. The Squares can be rented, so weddings and wedding receptions, luncheons and other private activities take place frequently. The City’s policies and protocols keep these private uses from unduly interfering with the use and enjoyment of the Squares by the public and nearby residents. 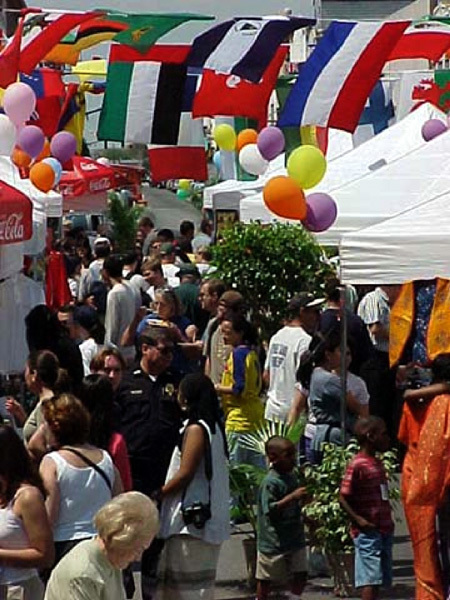 Some squares are noted for annual events, such as the Blessing of the Pets in Troup Square, and block parties and neighborhood gatherings are common. The Squares are the scenes of public celebrations such as the annual St. Patrick's Day Parade (touted as the second largest in America), and the City routinely sponsors music ensembles in Johnson and Wright Squares where van loads of seniors, office workers and visiting girl scouts all picnic and listen under the live oak trees. But perhaps the Squares are best loved for the pleasure and enjoyment they give individuals every day. Magnificent live oak canopies, wide brick sidewalks, inviting benches, refreshing fountains, intriguing monuments and public art, and the feeling of being in beautiful outdoor rooms produce an almost palpable sense of ease and pleasure in most of the users of Savannah's downtown squares and parks, young and old, black and white, tourist and Savannahian, alike.